flows in a channel and concentrates vortex-like into the point of my conception. The conception is an explosion of light. The energy of a whole life condenses into a single point. Awareness in the form of the energy of a whole life whirls in a tunnel in linear time and explodes in matter…"
Scientists discover existence of zinc "sparks"
at moment of human conception. "Sparks" flew when Northwestern University researchers discovered a sperm enzyme's activation of a human egg creates an explosion of zinc. The size of these "sparks" is a direct measure of the quality of the egg and its ability to develop into an embryo. When they injected a sperm enzyme into the human egg, the researchers found it triggered an increase in calcium within the egg, causing zinc to be released. As the zinc is released from the egg, it binds to small molecule probes, which emit light, the fluorescence microscopy experiments showed. 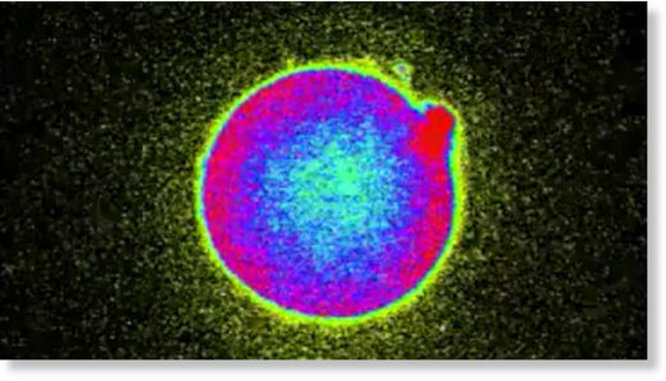 This is the first time the zinc "sparks" have been documented in human egg fertilization. This movie shows zinc being released from the egg during a zinc spark. "All of biology starts at the time of fertilization, yet we know next to nothing about the events that occur in the human", Teresa Woodruff, a professor of obstetrics and gynaecology and one of the study's two senior authors at Northwestern, said in a statement. "It was remarkable...to see the zinc radiate out in a burst from each human egg was breathtaking." Scientists discovered the zinc "sparks" five years ago during experiments on mice, pigs and primate species. Over the last six years, the team has shown that zinc controls the decision to grow and change into a completely new genetic organism. "This means if you can look at the zinc spark in the time of fertilization, you will know immediately which eggs are the good ones to transfer during in vitro fertilization (IVF)," said Woodruff. "It's a way of sorting egg quality in a way we've never been able to assess before." and its ability to develop into a viable embryo. Without the benefit of the study's findings, about half of fertilized eggs don't develop properly. Experts believe that a faulty genetic code could be responsible and have used video of an egg developing to try and pick up on problems early to check for genetic mutations. The invasive procedure can, however, damage the egg. Often times, the clinician had to decide which looked healthiest. The new findings in the study could change all that. "This is an important discovery because it may give us a non-invasive and easily visible way to assess the health of an egg and eventually an embryo before implantation," said co-author Dr. Eve Feinberg, a physician at Fertility Centers of Illinois. "There are no tools currently available to tell us if it's a good quality egg... this is so transformative." The eggs in the study were not fertilized with actual sperm, because human research is not permitted under federal law. The study, 'The zinc spark is an inorganic signature of human egg activation', was published in Scientific Reports.